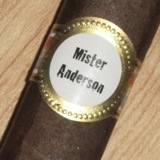 Mister Anderson is precisely the type of cigar you might expect in the cigar pack from Saints & Sinners (the private club built around the Tatuaje). It’s a little mysterious, but definitely good. It probably refers to John Anderson of Draper’s cigar shop in Washington, but there’s a little Matrix vibe going on too. I had one from another S&S cigar pack a few years ago, but that was much smaller than the large box pressed-size of this edition. The cigar itself is full-bodied, earthy, and gritty with some spice and excellent sweetness. If you can get your hands on one, it’s a fantastic treat. I am looking forward to smoking mine! !